When 16-year-old Laureth decides to search for her father, who she believes is missing in New York City, she takes her younger brother with her to be her eyes because she’s blind and wants to get through the trip without assistance from strangers. As the first-person narrator, Laureth is our way into the story. Sedgwick does an excellent job with her voice to describe her world from the perspective of someone who has no visual information. In terms of character development and emotions, she’s simple. It’s clear that her desire to find her father is probably masking her strong desire to prove to herself that she can be independent, her need to be seen as “normal.” In trying to pass as a “seeing” person, she makes her disability invisible. Laureth’s first clue to finding her father, and the thing that sets the plot in motion, is the discovery of his notebook. It’s kind of a MacGuffin—with the big exception that the notebook continues to be important throughout the novel (even when it seems, as would be the case with a true MacGuffin, that it’s time to move on). Sedgwick can’t abandon the notebook though, because it’s Laureth’s roadmap and case file in her quest to find her father. She’s active, but kind of ineffective as a detective, completely dependent on the notebook. The notes often contain clues that help Laureth decode her father’s state-of-mind and possible whereabouts, driving the action in many key moments. The notebook is also where Sedgwick gets to expand on his ideas about coincidences; it’s almost as though he’s pondering the ideas he’ll put in play when he returns to the main plot. The writing in these sections is denser and a bit “thinky,” but it mostly works. As with Midwinterblood there are ideas here that don’t cohere elegantly. Sedgwick is basically saying that coincidences happen all the time. Maybe they mean something, maybe they don’t, but the important thing is love. In the end, this the book tells us that coincidences, while mysterious, maddening and sometimes miraculous, aren’t really important because it’s love and faith that influence our lives the most. Sedgwick makes it there in the end (the man knows how to stick the landing) but it’s not a clean performance. Too much plot happens in the middle for any thematic building to stick. The dangling bits of information that are meant to reinforce the randomness of the plot—Benjamin’s problem with electronics; the cute guy on the plane—are just frustrating bits of unresolved plot. And once Sedgwick reveals what actually happened to Laureth’s father, well… it’s apparent how useless Laureth’s efforts actually were. It’s at this point though, that readers are hit with the “big message” on the last page. That last page certainly made me reassess my opinion of the book. A good ending should force the reader to think through the plot and themes. I found though, that the experience reinforced my feeling that there were a lot of ideas that never came together meaningfully. The structure’s impressive but the insides are a bit jumbled. 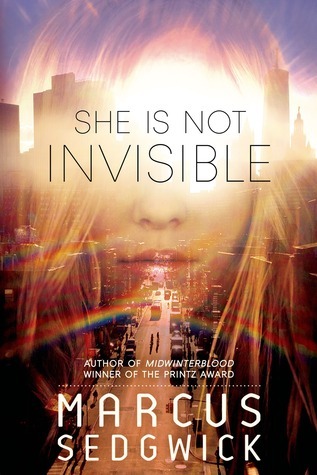 I can’t imagine a strong Printz defense for this title but, as with Midwinterblood, She Is Not Invisible shows some interesting technical skills. Is that enough to give it a place at the discussion table? I’m with you in that I’m not sold on this one, but I also wasn’t sold on MidWinterBlood and look where that got us. I think for me, I have a hard time with Sedgwick’s tendency to rely on vaguely painted Big Subjects. Laureth never quite became real for me, and her brother (whose name I have completely forgotten) really didn’t. And I think that technically this one is much more straightforward than MWB, which at least had that interesting repeating structure going for it. I don’t know where else to post this, but I truly hope the 2015 RealCommittee spends a decent amount of time at the table in Chicago. Even if it’s just for appearances. The only thing that irked me about the Midwinterblood win wasn’t that it didn’t deserve to win, but that the committee finished discussions so early that it gave an unclear impression of just how much thought went into it. Of course there are no rules about how much pre-discussion can take place, and I’m certain that the 2014 RC didn’t make their choices lightly. But again, it was just that *perception* that made me a little uneasy.